Wow, that south easterly blew up today as predicted. Extra lines on the skiffs tonight, a rather large swell rolling in from the south west rocking the docks, yes, nice to be in a land based lodge tonight. The fire is roaring, the guides are grubbed up and in the sack as they sleep it off and get ready for a big day tomorrow. 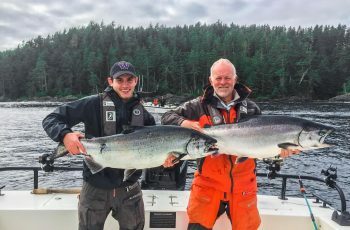 The bite yesterday was sporadic, a few chinook at a time squirting through, some boats luckier than others. I found the morning to be infested with 8 lb coho, but we grabbed one northern weighing in at 16 lbs, a big beak on him to, and a crazy coho fight made it a memorable fish. I did not see much for size or quantity in the chinook department, looked in the fish pit and saw buckets of coho. The afternoon saw some chinook move in, predominantly teenagers, although we did land a 25 lb specimen. I saw Bud had a 27, a few others in the high twenties, but 16 to 18 were the norm. And yes it rained hard! A real soaker. 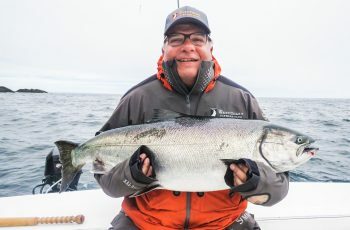 This am we pounded coho and the backside of Andrew, into Rat Bay but the kings were real slow on the bite, myself coming in with one 18 lber. Had a yellow dot the size of a loonie on its gill plate. Kind of unique and always a question arises about the yellow dotters. The pm fish was a soaker with a south east gale, real good times. The boats thinned out by four and Coho point was deserted. We took advantage and Gloria Grove hammered a 34 which put up a good struggle. Upon landing the fish we noticed a 100 feet of mono and a swivel, also noticed the hooks down the throat, yes a gut hooked break off. That fish fought hard , imagine swimming with two hooks and a 100 feet of line dangling out your mouth, now that’s mouth breathing! 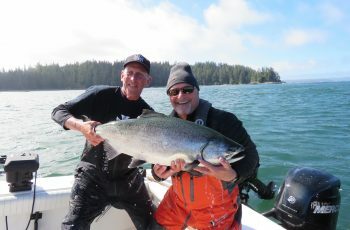 We also picked up a big 14 lb coho, in between vicious boats with sea sickness, thank goodness for a big tide change. The water was manageable, but bouncy, not a bad ride in a huge whaler, not so much in a skiff. It rained buckets, thunder showers…wow, were we wet! We called it at 630, sanity prevailed. When I arrived at the dock we were the last guide boat in. 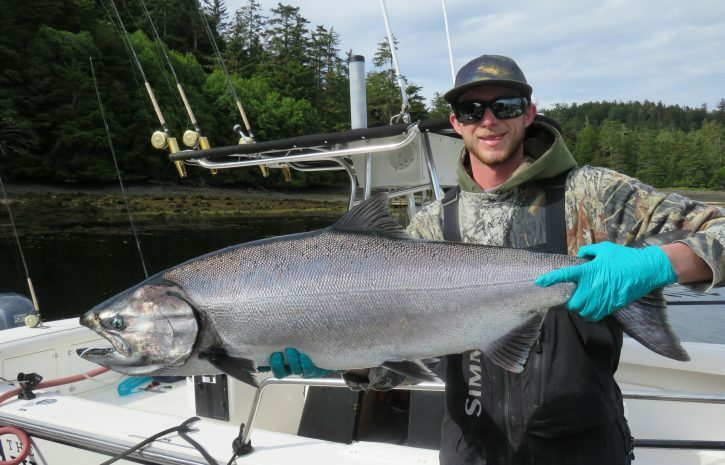 I interviewed Jason and his boat had a tyee today. Jason reminded me Chutter had a 34 at coho in the am. Kui found a 29 for Linda Pearson at Rat Bay. I see 6 tyee for the trip, so yes, the chinooks are still around. I think we will be on them again when the wind settles down. I am finding the bite better late afternoon. Store Clerk and myself snuck out after work yesterday, and we found steady if not great action for about two hours. I have no real idea how deep she was fishing other than she was on the starboard downrigger and using her secret cut plug herring roll, yes I think she pirated my roll. 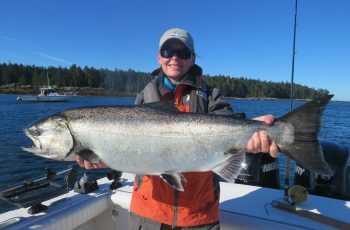 She had a number of chinook up to 23 lbs and a bushel of coho. 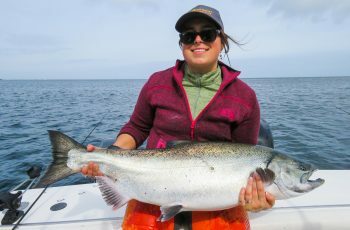 Her biggest chinook came off the stern mooching rod nailed on a perfect hook set and a crazy good fight. Well tomorrow looks promising, I hope to have another full report for you. Time now for rest, fuel, ice, and a full grub up, see you all tomorrow and thanks for checking in.